I know everybody knows that Tuesday is our weekday date. Since Ian go off to gym (Fitness First), We have limited time to see each other in a week. But we both arranged that every Tuesday, Friday and Saturday we will be together. Sometimes, if not Saturday we make sure to hear the mass every Sunday. We had petty argue last Monday that makes me feel sad for the whole night. We did not resolved the problem because we are both tired from work. We meet last night to have our weekday date, unfortunately he keep me waiting for an hour. Thank God I have A-card to calm me down, relax and have to use free internet access at E-Lounge. Ian ask me if I'm okay, I will be so stupid if I say "I'm fine! 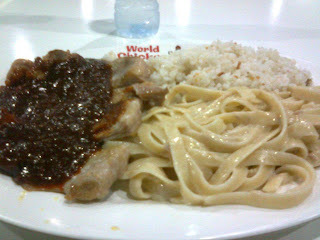 ", so I keep my mouth shut for an hour, until we settle for our dinner at Food Choices, Glorietta 4. He chooses World Chicken, of course his treat! haha.. 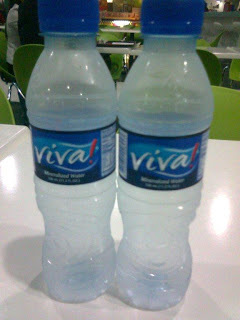 Since Ian already know what I want, he didn't ask me anymore..
A bottle of water that makes my temper cold. 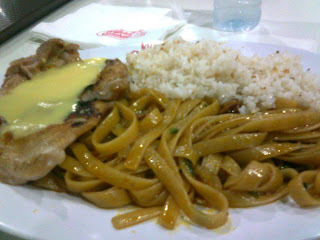 Our dinner is strange, we don't talked too much unlike our usual dinner date because we both know that there's something wrong between the two of us but after we eat, we finally reconcile our problems. Thank God again.. We decided to do window shopping, we saw lots of camera accessories in Glorietta 4 but holding our breath, we didn't buy anything.. haha...When on our way to exit, Ian saw the Penshoppe Shop. As usual, he tried to fit Polo and ask for the staff to get a large size. I though he was only trying that polo and leave it. But I was wrong, he brought it. He told me that he will be wearing that Polo on our Pre-Valentine's Day Dinner on Feb 11. Haha.. (We will be out of town for the first time to celebrate Valentine's Day! ).